You could write a one-act play based on this photo of the Obama family. 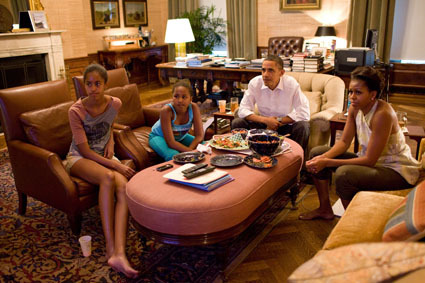 If you enjoyed the shot of Barack Obama and his national security team watching SEAL Team 6 take out Osama bin Laden back in May, you'll love the homespun remix: Obama and his family watching the US women's team compete in the World Cup final. Possible reason: Knows she still needs to do homework when the game's over. Possible reason: Knows that these games are 90 minutes with no commercial breaks, and then what if it goes into overtime and how long does she have to set here pretending to be interested in soccer, it's not like anyone else in the country actually is, and anyway Barack better not be better not be smiling because of that Alex Morgan girl.